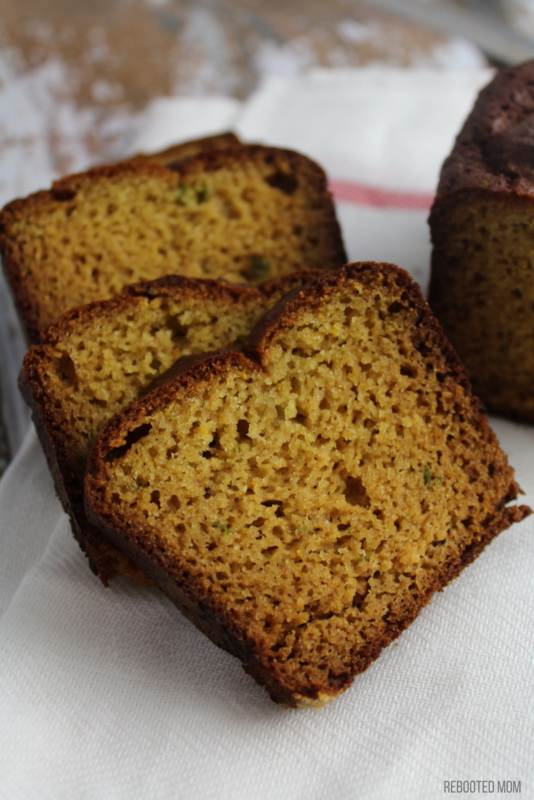 Just a few weeks ago we made this incredible Paleo Zucchini Bread and it was a hit with kids and adults in the family. We used that same recipe without cocoa to whip up this jalapeño and yellow squash bread to use up the veggies we had in the fridge before heading out of town on a long road trip. Drag out the food processor and shred a medium yellow squash – then remove the stems and shred in the food processor after the yellow squash. It’s not necessarily to squeeze the water out of the squash or jalapeños – we just scooped out of the processor and then blended the other ingredients right in the same food processor before adding the shredded veggies back in. Maple syrup gives the bread a naturally sweetness – but you could also use honey instead. Once the bread is done, allow to cool, remove from the pan and wrap generously in plastic wrap, then wrap and place in a zipper bag and refrigerate for up to a week. The bread warms up wonderfully in the microwave – and holds together so well when sliced. *The recipe made one loaf + 2 regular muffins for me – but wasn’t quite enough to fill up a regular bread loaf pan. If you are making mini muffins, it will stretch to around 26 smaller muffins. The bread freezes wonderfully when double wrapped in plastic wrap and stored in a ziploc bag. It’s perfect for a healthy snack! Moist and delicious paleo yellow squash and jalapeño bread with simple ingredients and sweetened with maple syrup. Preheat your oven to 350 degrees F, and grease & lightly flour a 6x4 (small) loaf pan or baking dish with a tiny bit of almond flour. In your food processor, shred the yellow squash, then shred the jalapeños. Then lift out gently and set on a few napkins on the counter. With that same food processor, combine the eggs, maple syrup, coconut oil, vanilla extract, almond flour and baking soda and pulse briefly until well combined. Lift the lid on the food processor and place the shredded yellow squash and jalapeños inside - lock the lid back on and pulse once more very briefly until zucchini is combined - you may have to scrape around the sides. Pour the batter into the greased and lightly floured mini loaf dish and place in the oven at 350 for 30-35 minutes until it no longer jiggles in the middle and a toothpick inserted in the center comes out clean. Remove and allow to cool completely. Run a knife around the outside of the bread and gently flip the loaf dish in your hand to turn out the bread. Wrap the completely cooled loaf in plastic wrap, then place in a zippered bag and refrigerate for up to 7 days if you are not enjoying immediately. To freeze: Double wrap in plastic wrap and store in a ziploc bag in the freezer for up to 2 weeks. Thaw at room temperature and heat slices in the microwave before serving. 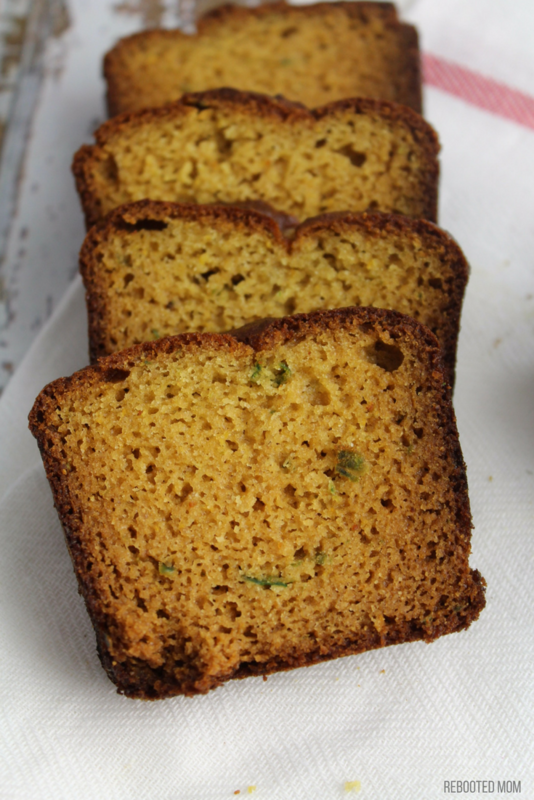 Share the post "Yellow Squash and Jalapeño Bread (Paleo, Grain Free)"